Session on Self Employment Opportunities Economic independence helps the person to develop in all the aspects of life. Keeping this view in mind Voice Vision conducted a knowledge session on self employment opportunities for visually impaired at Umedbhai Patel English School, Malad, Mumbai, from 3:00 to 5:30 PM on 7th of July 2013. All participants present were welcomed by the founder director of Voice Vision Miss Sushmeetha B. Bubna, who then introduced the flow of the event and guests, Prof. Anand Desai from HK Institute of Management & Research, who has more than 20 years experience in corporate world and in marketing, Mr. Akshat and Ms. Niti from Global Shapers Launchpad, Mr. Tushar Gosar and Mr. Paresh Satra entrepreneur. Firstly Prof. Anand Desai highlighted the basic points one needs to consider before starting a business. Which were analyzing about the demand of a product or service, the current supply of the same or availability of the same in the said area, information about the competition, how can one be different from the competition etc. He emphasized that each businessman should also look for interest, passion & knowledge homed by him or her, prior of setting up the business. He also spoke about lone opportunities for visually impaired individuals &discussed the importance of Small & Medium Enterprises in the current scenario. Mr. Akshat and Ms. Niti revealed a pleasant surprise by introducing the mentoring project of supporting and working with new or budding entrepreneur for 3 Months, in collaboration of Global Shapers Launchpad & Voice Vision. Their team extended help to the individuals to move their business idea’s to execution stage. 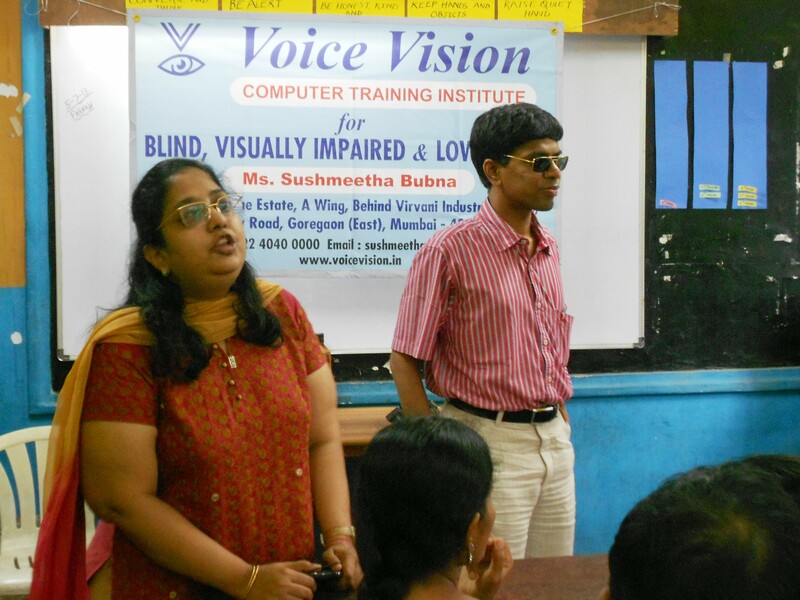 Interested persons were asked to fill up a form on Voice Vision website with their idea & problems they faced. The offer of mentoring served as a great support to the audience. After which Mr. Tushar and Mr. Paresh shared their experiences, challenges and success regarding Manufacturing and Distribution business respectively. They also offered the opportunity to the visually impaired individuals to join with them in their business. Mr. Tushar Gosar manufactures spices named as “Tasty” brand. He started the business with 1Kg Garlic chutney which he used to sell in his colony. But now he has around 10 to 12 salesman, who market his products to the shops from Borivali to Dadar. 80% of Shopkeeper’s between Borivali & Malad area sell products from Tasty brand. He has strong assurance of his products taste and quality. On his way to expand the business, he invited all the participants to join his business not as employees but as entrepreneurs & earn margin as per their wish & efforts made. Followed by Mr. Tushar, came Mr. Paresh Satra, who is a distributor of Samsung Mobiles and its Accessories in Navi Mumbai. Taking ahead the legacy of distribution business from the Britannia biscuits to Samsung Mobiles wasn’t easy for him. Faced lot of ups & downs, but today had brought to a sustainable level by expanding his sales network. Mr. Paresh personally visits approximately 350 shops, taking care of their requirements & complaints. He said, “To sustain the business it’s very important for an individual to have patience”. Lastly he shared business opportunity to all individuals, who can buy & sell as many mobiles as possible & earn desired profits. The session was highly interactive and knowledge sharing, which ended with the felicitation of the speakers by Ms. Sushmeetha B. Bubna. We expressed our heartfelt gratitude to the speakers for the session, who shared their knowledge and spent their valuable time with us. We also thank the Trustees of Umedbhai Patel English School for lending their premises for our session. We would like to thank all the Volunteers from Thakur College and Ascent Networks Pvt. Ltd for their prompt services. Lastly would like to thank all the 60 participants, who came from various cities & states, believed in us & took full efforts to attend the said session.